GRAND RAPIDS, Mich. – Whiskey and bourbon lovers will soon be able to purchase a limited-release Knob Creek single barrel bourbon at select Family Fare, D&W Fresh Market and VG’s locations throughout Michigan. The barrel was hand-picked and aged nine years, with only 270 bottles available starting today. The SpartanNash-exclusive Knob Creek bourbon was hand selected by SpartanNash associates and local bourbon lovers from the Jim Beam inventory. Twenty nine retail stores will carry the limited-release single barrel, 120 proof bourbon. 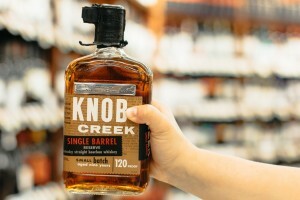 Twenty nine retail stores will carry the SpartanNash-exclusive Knob Creek bourbon, including Forest Hills Foods (located at 4668 Cascade Road, SE in Grand Rapids) and Family Fare, D&W Fresh Market and VG’s locations in Rockford, Cascade, Holland, Williamston, Fenton, Petoskey, Gaylord, Grayling and Grand Rapids. A full list of participating stores is available at SpartanNash.com/grocery-retail/bourbon-exclusive. The Knob Creek single barrel bourbon will be prominently displayed in participating stores and features a unique plaque close to the neck of the bottle, identifying it as a SpartanNash exclusive. Knob Creek bourbon is part of the Jim Beam Small Batch Bourbon Collection. The 120 proof, single barrel bourbon is full-bodied and well-rounded, featuring sweeter profiles of caramel, toffee and chocolate and a hint of fruit. In March, SpartanNash associates and local bourbon lovers travelled to Clermont, Ky., where they hand selected barrel 3652A from the Jim Beam inventory for its flavor notes. The bourbon was put into its barrel on Nov. 14, 2006 and aged on the west side of Warehouse N on the top row of rack 41. The SpartanNash Knob Creek bourbon retails for $49.96. SpartanNash is also collaborating with New Holland Brewery on a second limited-release bourbon. The beer barrel bourbon was also hand-selected by SpartanNash associates and will be available in retail stores this fall.